Two French Bulldogs: One or Two or Three Pups? One or Two or Three Pups? Have a serious question.. We have Bub who's 1yr 4mo. He does EVERYTHING WITH US! I cook for him.❤️ we found a 9 month old male that needs a home... Is having 2 a lot more work than one...Just wanting to do the right thing. We are re-posting this from May since we have been asked the same question by three other friends. We adore them both too and enjoy their antics. Have a fabulous Friday. We are back! We would love to have a third pup but the Man says no! We think it depends on the family. Four small doggies is just right for us, but things can get very interesting sometimes!! The folks in LBR say that boxers are like potato chips -- you can't have just one! BOL! But having two dogs is nice because they can play with each other and keep each other company when the humans are gone. Two dogs are more work than one, but not twice the work. AHHHHHHHHH WHAT A GREAT ANSWER!! Two pups are more work than one, but also more fun! We hope they decide to give that little Frenchie a home! Mom is feeling pretty stressed out since she brought Taffy to live with us. I think its because she feels like we aren't as close as we were, also, she's such a different dog from me, not like having 2 Doxies. Then there's the cat... Love Dolly etc. It may be more work for additional pets, but they do amuse each other, don't they? And that is fun to watch. I love your pictures of Edward and Lily together, and I loved seeing Lily and Benny together; it's obvious how fond they are of each other. Oh, and when we had our first Mastiff, we also had cats, which the Mastiff adored. He especially loved kittens, and they all loved him. One is so easy, says the mom, but two is much more fun. Three is pushing it, but still fun. Our mom thinks the same way! We just posted some impawtent information and dates about upcoming events you will want to check! We bet you two are the light of your Mom's life. We have been two, then three, then four, now three - Mom says the more, the merrier. So why can't we be four again? One to two is a much bigger switch from two to more! We have three....so more work and more laughs! 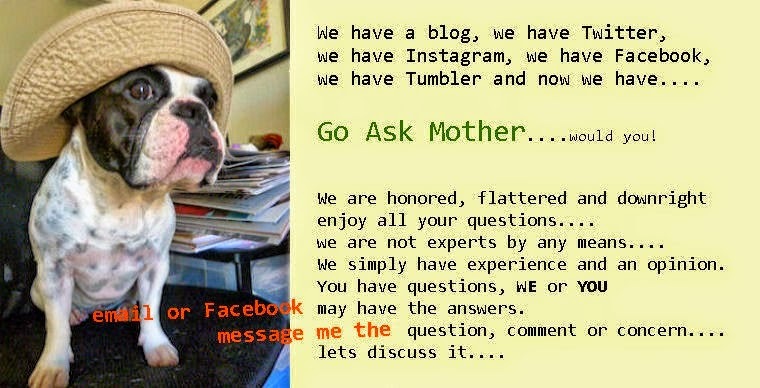 Your mother has the best answers! You gots Twitter? Me, too!! I's @FinleyWestie ovfur dere! Good response....having more of anything means more work but then again it's also double the fun and double the love! !